Walking Off the Big Apple, a popular New York City blog founded in the summer of 2007 by writer Teri Tynes, plans a new season of walking adventures. 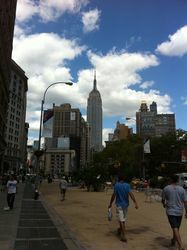 Since 2007, Walking Off the Big Apple has developed a loyal audience looking for creative adventures in New York City. The blog features posts on literary history, urban planning, architecture, and the visual arts. Many posts take the form of self-guided walks based on various figures in New York arts and letters, including Greta Garbo, Georgia O'Keeffe, Sylvia Plath, James Weldon Johnson, Bob Dylan, Edith Wharton, Herman Melville, Henry James, Raymond Hood, and the Marx Brothers, as well as walks centered on important fictional characters like Holly Goligthly and Mame Dennis. Creator and writer Tynes says, "I'm after nothing less than the re-enchantment of the city." Recent posts on Walking Off the Big Apple have included a list of helpful mobile apps for walking New York City, a list of the major museum openings for Fall 2010, an account of a day trip up the Hudson River, and advice on how to "walk off" a pastrami sandwich (hint: it's not easy). The site is organized by topic, including walks based on neighborhoods, the fine arts, cinema, and architecture. Sophisticated and charming, Walking Off the Big Apple is inspired by the classic tradition of New York arts and letters. Subjects of upcoming posts include Mickey Mantle's New York, Andy Warhol, interviews with well-known New York artists, and 25 Great Things to Do in Greenwich Village. Readers of TheBloggersGuide.com voted Walking Off the Big Apple as the Best Travel Blogger in North America. Walking Off the Big Apple was proclaimed the Best Travel Blogger in the world in the Times of London's own readers poll. Walking Off the Big Apple is on The New York Times CityRoom Blogroll. Fans of the blog come from all over the world, but the majority of readers happen to originate from New York City's five boroughs.